Doctor Monro: And your new students, are they enjoying your lectures? Doctor Robert Knox: Er, not as much as I understand they're enjoying your wife,sir. 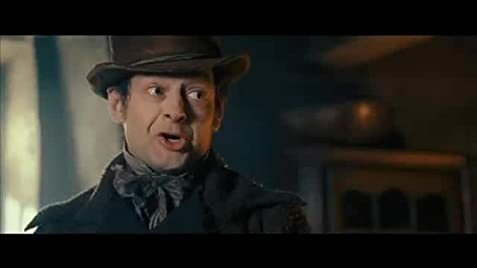 Burke and Hare is a fast-paced, fun filled riot and the title roles are inhabited brilliantly by Simon Pegg (as William Burke) and Andy Serkis (as William Hare). Harking back to the good old American Werewolf days, Burke and Hare joyfully plays with your expectations, creating characters you like and sympathise with and then making you squirm as they nonchalantly murder their way through Edinburgh. Andy Serkis proves that he is the most easily likable man in the world with his earnest, all or nothing approach to acting, and as he reasons that mankind's fate is sealed the moment they're born, you almost find yourself nodding along happily when he suggests "helping them along the way". Simon Pegg has the straighter role, though not by far, as he gleefully goes from love-struck puppy-eyed romantic to monstrously suffocating old ladies in the blink of an eye, his facial expressions, mostly of dim witted "innocence" perfectly contrast with Serkis (Burke's reaction to Hare's coinage of the term "burking" is hilarious). All in all the duo are a perfect pare, thick as thieves and as funny as, well, horrible murderers.